Like the Giants winning the World Series, Pete Carroll and the Seattle Seahawks strike during even years. Only, instead of championships, the bird boys have made a biennial habit of incurring hefty fines for violating OTA non-contact rules. In 2012, the Seahawks cost themselves two practice days after the NFL found that they’d started contact drills too early. 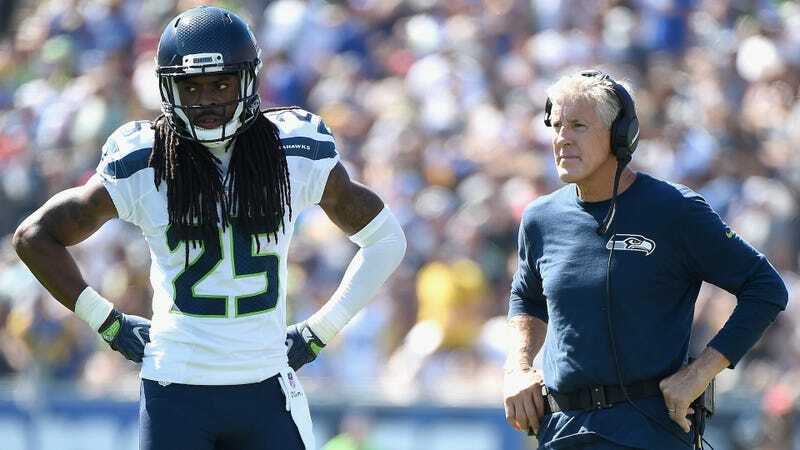 In 2014, Seattle had to pay $300,000 and give up two practice days after early practices featured “excessive level of on-field contact.” Today the NFL announced that the Seahawks had kept up their end of the deal and violated the contact rules again. This time, the penalties were much harsher. The Seahawks have to pay $400,000 in fines, lose a week of practices, and give up a fifth-round pick. Because the pattern is so established under his watch, Carroll also has to pay $200,000. The violation occurred when two players who were not wearing helmets collided, and their heads hit each other, a league source told ESPN’s Sheil Kapadia. The league reviewed the play and deemed it excessive. Maybe Pete Carroll should cool it.